We tried Beef Carbonnade from the Slow Cook Book. Cubed beef is slow-cooked in a mixture of shallots, seasoning, garlic, sugar, nutmeg, bouquet garni and beer. We used a can of Hobgoblin. Slices of French bread spread with Dijon mustard are added halfway through the cooking time. These soak into the pot and enhance the gravy. Parsley is sprinkled over the top at the end and we served the carbonnade with a jacket potato. A very enjoyable meal. We opened a bottle of Prospector Shiraz 2013, a full-bodied Australian red from Naked Wines. There were blackberry fruits on the nose and the palate delivered a creamy vanilla sweetness and rich, smooth black fruits. The wine was a very good match with the meal. 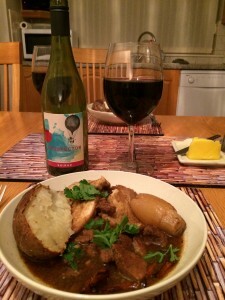 We enjoyed the leftovers of this carbonnade with a bottle of Reserve de Pierre 2013, a medium-bodied Southern French red also from Naked Wines. This blend of Grenache and Syrah displayed nice legs in the glass, a red berry creamy sweetness and a smooth finish with a hint of spice. Another very good match. Previous Previous post: Which White Wine with Rick Stein’s Moghul Chicken Korma? Next Next post: Spanish or Australian Red with Slow-Cooked Lamb Korma?